Raspberry Rainbow: Felt Squishies go to Market. Eeekkk, only one week to go until my very first market. I am nervous and excited, I have no idea what to expect. On the day, I will have a big bowl of squishies available. I must thank my mum who made most of these for me on her recent visit. What are squishies?, I hear you ask. 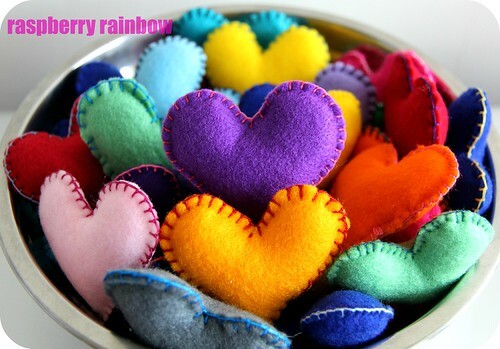 They are hand made little felt love hearts, for your child to squeeze if they are feeling anxious or missing you. We love squishies in our house. They have saved the day on so many occasions when Abbey has been upset before school. I find one in her school uniform pocket most days if she is having a challenging week. Some weeks she won't use her squishies at all (she has two of them). Her squishies have been through the washing machine a few times too - and survived. 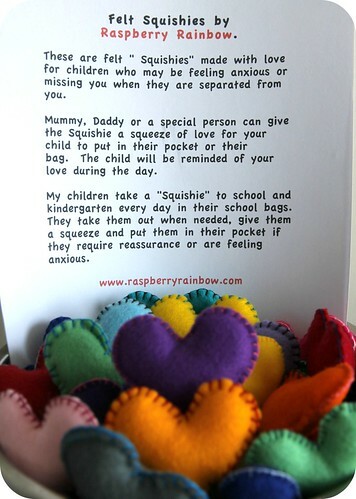 We have been using these little felt squishies for years now, they really offer comfort to children. These are such a gorgeous idea Cat. I had no idea this was your first market. You'll be fine!! Your stuff is gorgeous!